What is Botanica Fermented Turmeric Ginger? Botanica Fermented Turmeric Ginger is made up of active beneficial yeast and bacteria. The fermentation of turmeric and ginger helps bring out the nutrients of organic acids, enzymes, B-vitamins, and micronutrients. Essentially, this product is supposed to help increase energy levels, reduce inflammation, and support a healthy intestinal tract. It is also possible that this product could help with joint pain, mental conditions, and cancer prevention. The only active ingredients in this product are fermented ginger and turmeric infusion. These ingredients are meant to help increase energy, reduce inflammation, and support a healthy intestinal tract. Turmeric’s active ingredient curcumin is often used as an anti-inflammatory and antioxidant. Ginger also works an anti-inflammatory and antioxidant, but is mainly used for its ability to improve gastrointestinal problems. This product is dairy-free, gluten-free, GMO-free, and soy-free. This product is safe for vegetarians and is made from organic ingredients. The recommended dosage for this product is four teaspoons a day. It can be mixed with water or juice. There is no specification regarding if the four teaspoons should be taken all at once, or if they should be taken throughout the day. The price varies depending on where customers decide to purchase this product. Botanica Fermented Turmeric Ginger cannot be purchased through the manufacturer’s website, although customers can use their “where to buy it” tool to find out where it is sold near them. 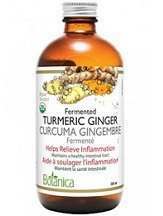 However, Botanica Fermented Turmeric Ginger can be purchased through other websites as well. AViVA offers a 250ml bottle for $23.99, and a 500ml for $39.99. Nature’s Source offers a 250ml bottle for $24.99, or two bottles for a $44.98 deal. Well.ca offers a 250ml bottle for $23.29. Not all websites ship to the U.S. The manufacturer does not list any side effects on their website. However, according to other medical reviews, individuals with gallstones, bile duct obstruction, stomach ulcers, or excess stomach acid should not take this product without a doctor’s recommendation. Pregnant and nursing mothers should also not use this product without a doctor’s recommendation. Since Botanica Fermented Turmeric Ginger cannot be purchased through the manufacturer, the manufacturer does not offer any guarantee. Customers will have to research the return policy of the store, or website, they decide to purchase this product from. More than likely, opened products will not be able to be returned. After careful review of Botanica Fermented Turmeric Ginger, it is difficult to determine the effectiveness of the product. Information about this product is very difficult to find, as the manufacturer’s website only includes a paragraph about what this product is and how to use it. There are no customer reviews about this product making it difficult to gauge how frequently this product is used and how it affects users. The ingredients used in this product are often trustworthy and are successful in treating joint pain and inflammation. However, since there is no information regarding how successful this product is, customers may want to take caution before using it.